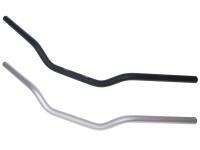 Classic motorcycle handlebars from 6061 T6 aluminum. 730mm wide with a continuous tube diameter of 22mm. Please select required colour from list below.